The availability of the public beta means users who aren't signed up for the Apple Developer Program can test the software update ahead of its official release. Bear in mind that Apple's intention is to act on user feedback to iron out remaining bugs and issues, so the stability of the beta isn't guaranteed and probably shouldn't be installed on a Mac that you use every day. With those caveats out of the way, here's a step-by-step breakdown describing how to download and install the macOS High Sierra Public Beta on a Mac. In the same Get Started section on the beta site's Mac tab, click the profile button under where it says Download macOS High Sierra public beta access utility, and wait for the file to download. When the installer has completed the download, the Mac App Store should open automatically showing the Updates screen. Click Update to download the public beta software. (If it doesn't show the public beta in the Updates list, manually restart your Mac and navigate back to the Updates section in the Mac App Store.) When the download is complete, your Mac should restart automatically. If the macOS High Sierra installer doesn't automatically open upon restart, launch it from your Applications folder using the Finder. A dropdown prompt will appear advising you to back up your Mac. Click Continue - assuming you've already backed up. If not, click Cancel and do that now. Click Continue at the bottom once you've finished backing up, or if you already performed a backup. And that's it. 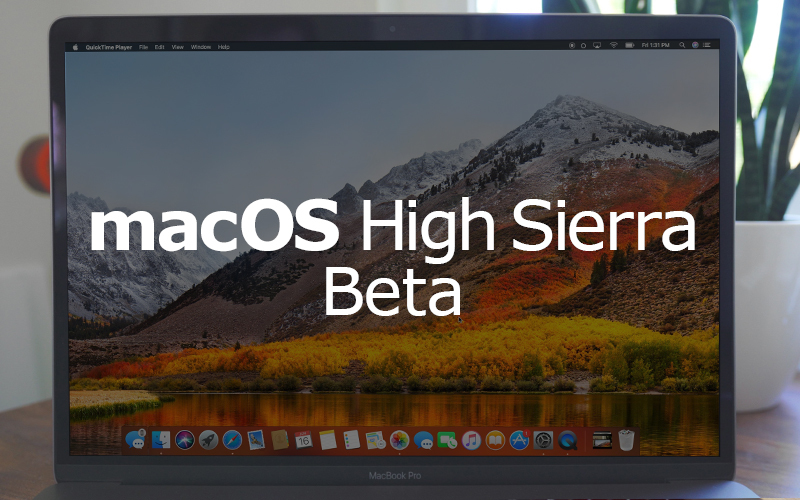 Your Mac should now be running the macOS High Sierra Public Beta. For a complete picture of all of the new features you can expect to see when macOS High Sierra is released in the fall, make sure to check out our full macOS High Sierra roundup. Step 2: Seriously, why would you do this? Do you not actually use your computer? Did I brick my comp? Why is this beta so buggy? I didn’t back up before install, how do i go back to the old os asap? Apple why did you do this to me? Here's to hoping our older Macs benefits from APFS! So...you're saying I should install this on my friend's computer rather than my own? Got it. I'm waiting til next year for REALLY High Sierra. I did read the article, and in not one single quote you referenced did they mention backing up; probably the most important step in installing a beta operating system. It's irresponsible to not mention it. A dropdown prompt will appear advising you to back up your Mac. Click Continue - assuming you've already backed up. If not, click Cancel and do that now ('https://www.macrumors.com/how-to/time-machine-back-up-mac/'). What about installing it in VirtualBox? Well, after about years of being an Apple Public Beta Tester on my MacBook Pro, all has gone well. There have been a few bugs, but nothing that you can't get through until the newest release. I recently had to wipe my entire system and reinstall through Time Machine because the initial installation of High Sierra Beta froze and failed. I have definitely lost faith in their Beta program being at least well enough baked by release day for consumers to trust that they won't have to completely reboot their drives. And what is more, unless you are a "Developer", the beta program support line won't even help you. It's like the beta software program customer service has forgotten that they are part of apple, which is known for their customer service. If you are going to have a Public Beta Program, you need to have a support help line for them as well. Just common sense. If you still want to upgrade to the Beta software, my recommendation, wait for at least three releases before touching it. BACK UP YOUR COMPUTER FIRST! The fact that you guys didn't even mention it, but paved the way for people to ruin their computers, is somewhat bad.